IG: @AfricanFoods: White rice and Chicken curry sauce. 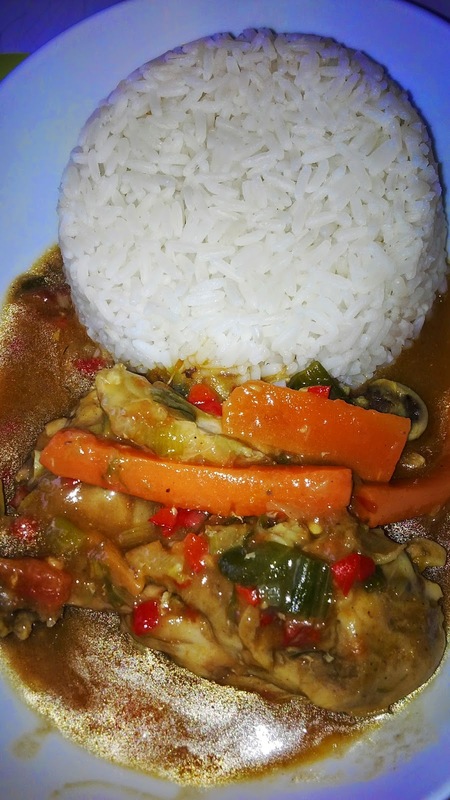 White rice and Chicken curry sauce. Chicken, tomatoes, red pepper, chilli, onions, carrots, spring onions,spices (Maggi, Salt, Curry, Thyme), garlic, ginger, oil. with garlic and ginger. Chop it into very small pieces and pour into a pan. Cut your chicken, wash and put in a pot with water, salt, thyme and onions.